My brain told me this instantly after my first bite of these tarts. Good that my taste bud and brain are communicating fast and well these days... LOL! Next, my brain instructed my right hand to pat my left shoulder... Pat! Pat! ...and kept telling me, "Good choice, Zoe! Good choice!" Pardon me that I have a strange habit of talking to myself and I also have a funny brain... LOL! I hope that I don't sound like I'm bragging but it is true that I'm very proud of myself for choosing this excellent recipe to bake for our bake-along with Joyce from Kitchen Flavours and Lena from Frozen wings. Seeing the bake-along bakes that I have baked at here, here, here, here and more, you might know that I'm obsessed with baking miniature cakes and bakes. To me, mini cakes and bakes are good because each serve has been reduced in its portion size and they are generally petite and cute to enjoy! Here is an again highly rated recipe from William Sonoma and also from the book, William Sonoma Baking. This tart recipe is really interesting to bake as this tart is mainly made of maple syrup and pecan nuts. Yeah... lots of maple syrup and pecan nuts! Instead of baking just one 20 cm (9 inch) round maple pecan tart as recommended in the recipe, I have used full amount of the pastry and half amount of maple pecan filling to bake a dozen of 6 cm (2-1/2 inches) rounds tarts. 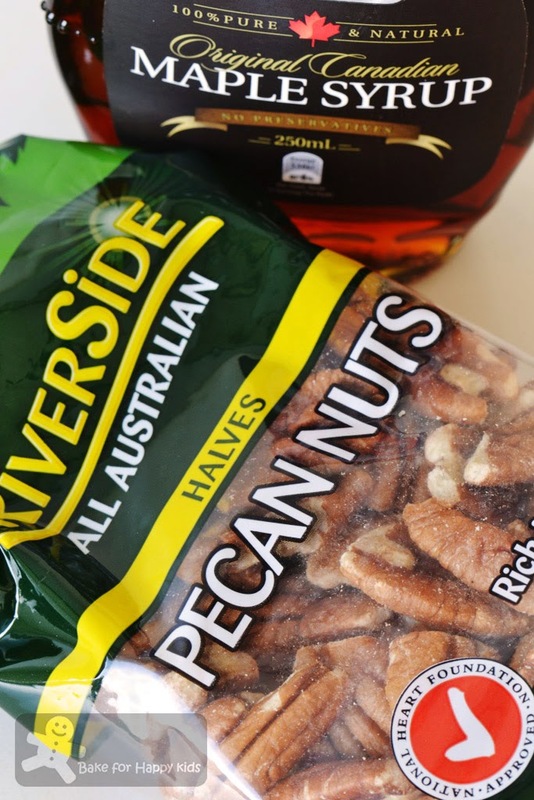 In fact, half amount of maple pecan filling requires 1 cup (250ml) of maple syrup and this amount is actually the entire standard-size bottle of maple syrup! Despite the massive amount of maple syrup used, the overall sweetness of these tarts is surprisingly spot-on! Absolutely, just right! The recipe uses reduced maple syrup very cleverly to coat the pecan nuts resulting these maple coated nuts to be extremely fragrant and addictive to enjoy. Double spot-on? I think so. With butter pastry bases, I would say these tarts are triple spot-on! Spot on! Spot on! Spot on!... LOL! Can't have enough of these triple spot-on tarts? Clearly, I deserve more pats (or maybe triple pat) on my shoulder... Pat! Pat! Pat! These tarts are mainly made of maple syrup and pecan nuts. Freezing the tart pastry before baking helps to prevent the pastry from shrinking. Yay! These pastry didn't shrink much! Next, keep boiling the maple syrup until it is thick and viscous. 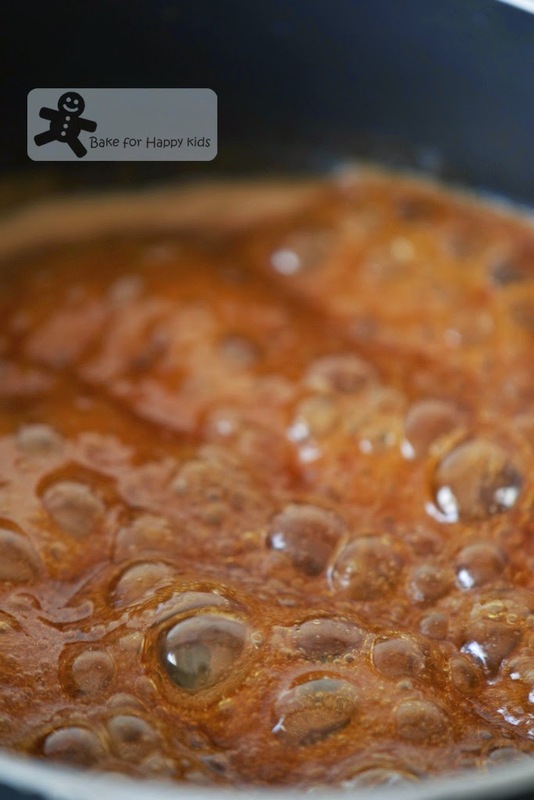 Cold reduced maple syrup can be like hardening caramelized sugar. A slightly warm reduced maple syrup is easier to handle. 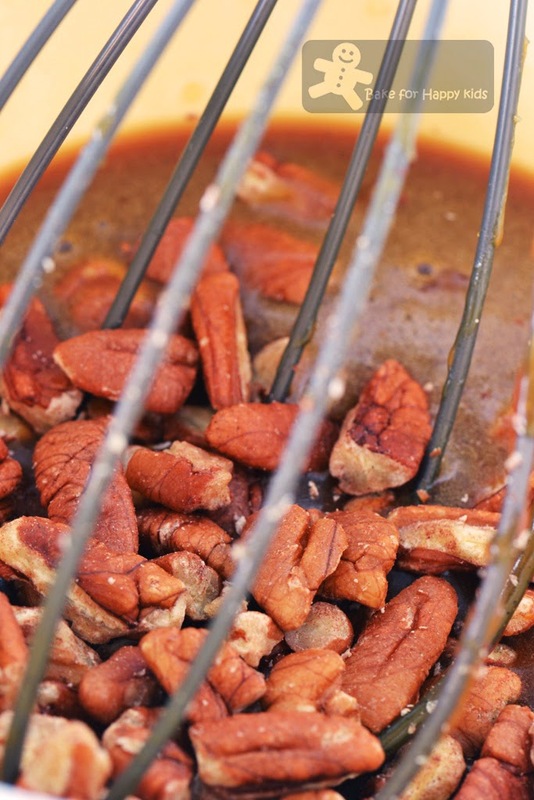 Add in the coarsely chopped pecan nuts. Spoon filling into tart pastry and bake! After the last three pats, I'm giving myself more pats again... because I had completed the recent Melbourne Marathon on 12 Oct 2014 for 3:40:44 and this is my best personal timing. Yippee!!! This is the method that I used... To make the dough by hand, in a large bowl, stir together the flour, sugar and salt. Using the finger tips of my hands, rub butter into the flour mixture until the texture resembles coarse crumbs, with the butter pieces no larger than small peas. Add the water and mix with a fork just until the dough pulls together. Alternatively... To make the dough in a stand mixer, fit the mixer with the flat beater, and stir together the flour, sugar and salt in the mixer bowl. Add the butter and toss it roughly with a fork to coat with the flour mixture. Mix on medium-low speed until the texture resembles coarse crumbs, with the butter pieces no larger than small peas. Add the water and mix on low speed just until the dough pulls together. Wrap the dough in cling wrap and allow it to rest in the fridge for 1 hr or more. Using a rolling pin, roll dough into 5mm thickness on a lightly floured surface. Using a 9 cm round cutter, cut dough into circles. Transfer each circle into each 6 cm round tart mould and pat it into the bottom and sides of the mould. Fold the overhang under itself and pinch it together to create a high edge on the mould rim. 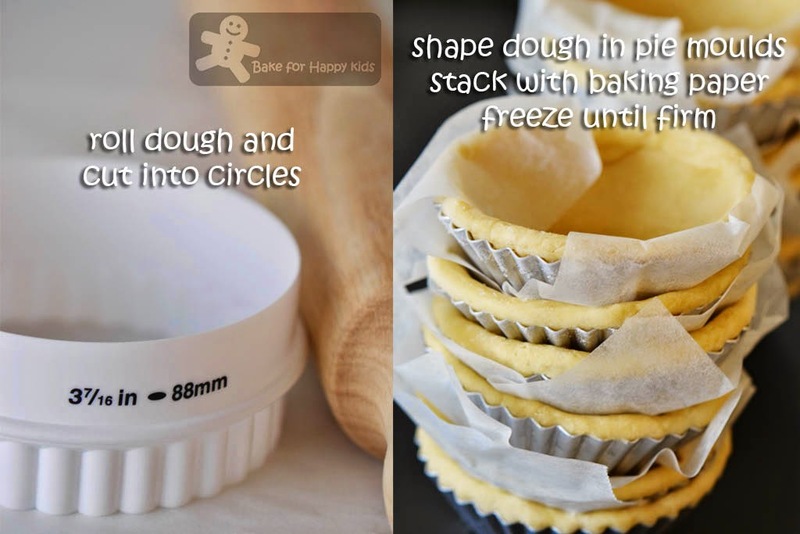 Refrigerate or freeze the pastry until firm, about 30 mins or more. Meanwhile, position a rack in the lower third of an oven and preheat to 375°F or 170°C fan forced. 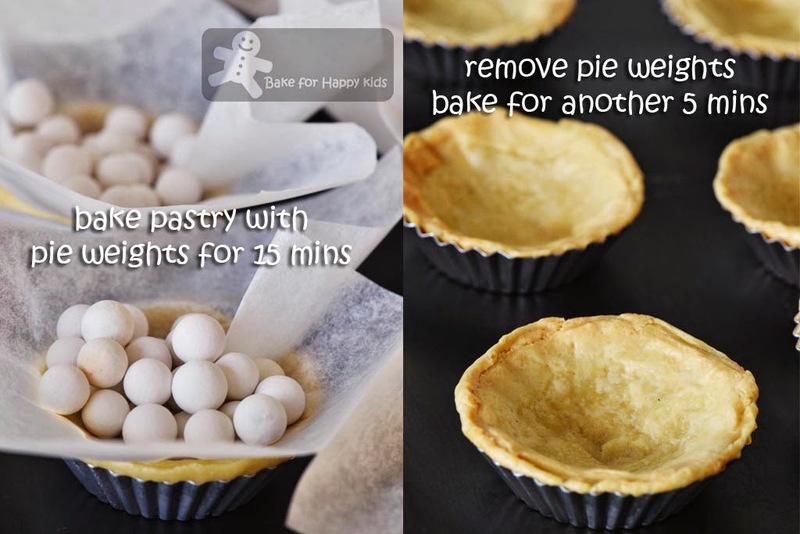 Line the pastry shell with baking paper and fill with pie weights. Bake for 15 mins, then lift an edge of the baking paper. If the dough looks wet, continue to bake, checking every 5 mins, until the dough is pale gold, for a total baking time of 20 to 25 minutes. Transfer to a wire rack. In a saucepan over medium-high heat, bring the maple syrup to a boil and boil for 10-20 mins to reduce. Remove from the heat. The syrup should be reduced to something thick and syrupy like golden syrup kind of texture. If necessary, return the syrup to the saucepan and continue to boil until sufficiently reduced. Let cool to room temperature before proceeding. 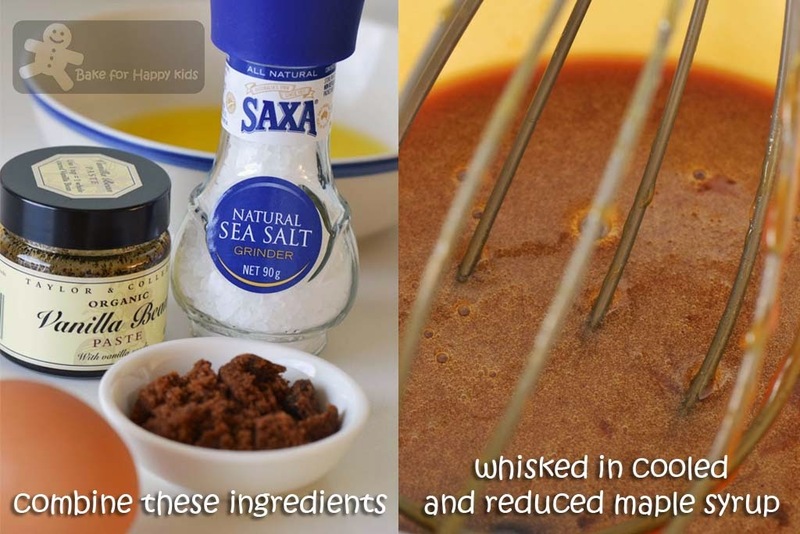 In a bowl, stir together the eggs, brown sugar, reduced maple syrup, salt, melted butter and vanilla until well mixed. Add the pecans and stir well. Pour into the partially baked pastry shell, making sure the pecans are evenly distributed. 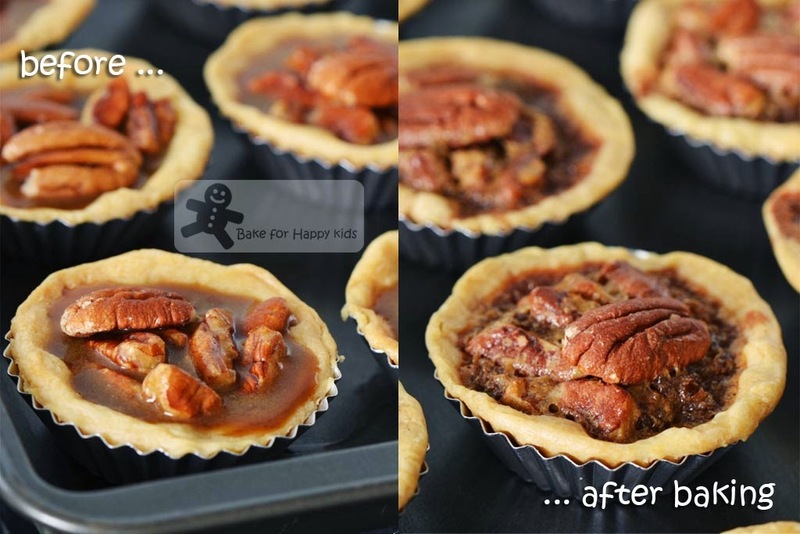 For a pretty look, you may place one or two pecan halves on each tart before baking. Bake filled tarts until the filling is slightly puffed and firm to the touch, 20 minus. Transfer to a wire rack and let cool until just slightly warm before serving. 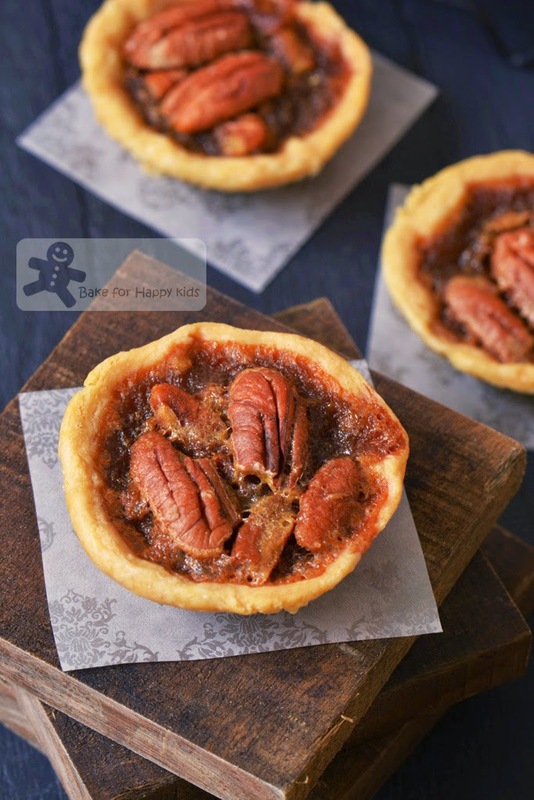 I love pecans, I love maple syrup, so yes, I love these tarts.. Oh goodness, I can have 20! Don't mean to brag too, but yes, if the food is good, I can finish them all.. The filling looks easy to make, instead of putting it into the pastry, I'd scoop and put them in my mouth - all of them, teehee..
Hmm...delicious little treats. I love pecans. They have many nutritional benefits. i love how you presented your as "mini bites"... pop, eat.. pop, eat.. without the guilt (or at least).. Damn, I love love the look of the filling! I've been dying to make a savory pie recently actually! Thats a very tempting tarts...cant have just one! Hi Zoe, yes a few big Pat ! Well done for completing Melbourne Marathon ! Your best personal timing ! Cheers! Okay .. the Maple pecan tart ... I like to make small tarts or pies. That's becos I don't have a big tart pan ... lol. 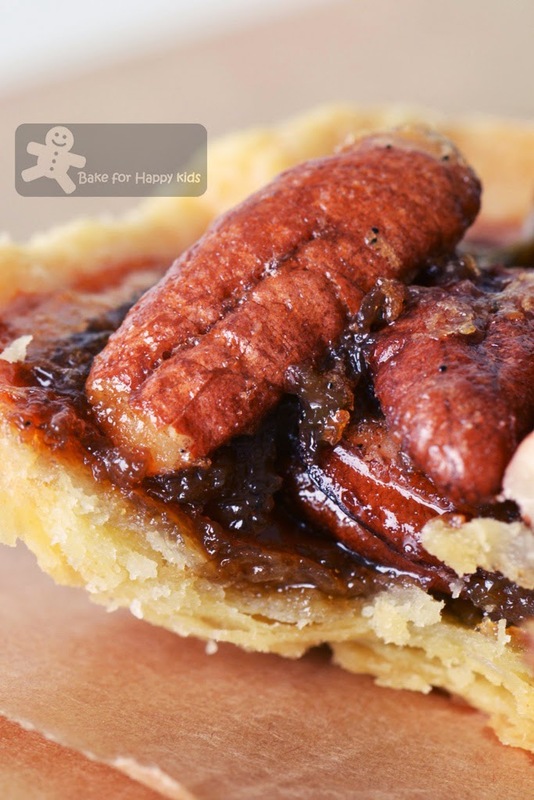 Your miniature maple pecan tarts look very inviting. But I'm still considering to attempt this recipe as I find it rather too sweet for me (maple syrup). Pecan maple filling.. sounds just amazing! 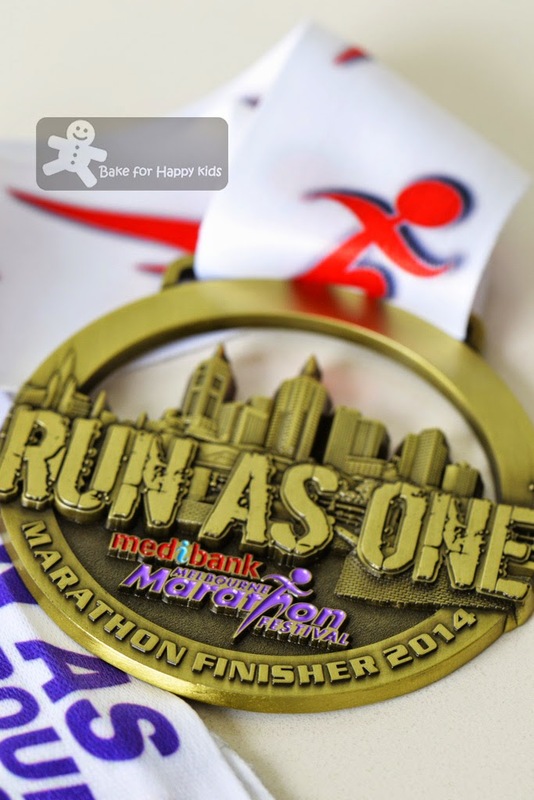 Congratulations on your marathon result! Very impressive! These lovely tarts would be a great way to celebrate it. I wanted to make small mini pies too, but was too lazy to fill up the moulds! I just told Lena, that I am very kiamsiap, use Lyle's golden syrup with maple flavour instead of pure maple syrup as it is very expensive! We had this pecan pie with ice cream, and it was good. hi zoe, after making the tart, i was thinkning i should hv omitted the brown sugar to make mine less sweet, Anyway, maple tarts are meant to be sweet! LOL! congrats on your marathon achievement again! Another gorgeous recipe, Z, perfect for Fall (here in the US). Zoe, congrats on your Marathon, well done! and so as your tarts, looks so delicious! Waa...you ran a marathon! you must be very fit! congrats! you deserve to eat as many pieces of those tarts as you like lol! Looks delicious but am not making for the fact that they are really expensive lol! Hi Zoe, ever since I started buying the unsalted mixed nuts from Costco, I started to appreciate pecan nuts more than before & I have to say that it has become one of my favourite nuts, more than I like pistachio now, haha! Love love love your pecan tarts! Zoe, looks delicious, I admired your talent, patience and intricated details on all your baking... you deserve lots of pat pat pat pat pat .. well done. I admire whoever completed marathon. Just so amazing...I just can't imagine run 26.2 miles. I have done the 5K a couple times but I thought I going to die. The tarts are very cute!